There are many verses in the Bible about earning rewards. Salvation is a free gift (Romans 5:15–16, Ephesians 2:8–9), but you can earn rewards after you are saved, and it is also possible to lose rewards (see I Corinthians 3:11–15, Colossians 2:18, II Timothy 2:5, II John 1:8, and Revelation 3:11). Rewards are based on many different things. “And whosoever shall give to drink unto one of these little ones a cup of cold water only in the name of a disciple, verily I say unto you, he shall in no wise lose his reward” (Matthew 10:42). The Bible tells us God will pass out five different types of crowns when we arrive in Heaven, plus other types of rewards. The great part is that rewards are given by an impartial Judge who makes no mistakes. Some believe crowns to be symbolic and not literal, but in the book of Revelation, the twenty-four elders in Heaven have literal crowns that they lay down at our Savior’s feet. It is possible to earn more than one crown, and when Christ returns, He has “many crowns.” History tells us a story about two Egyptian kings, one from the north and one from the south, who battled each other. The one who conquers the other takes both crowns, combines them, and fashions one new crown. 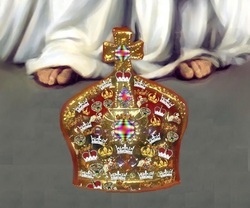 Perhaps something similar will happen if you earn more than one crown: Christ will create a single crown with parts from the different ones. First, he that earns the most gets the most rewards. In the parable, the one who earned ten pounds received ten cities to rule over, the one who earned five received five cities, and the one who did not earn anything received nothing. God does not divide up all the rewards equally—you get what you work for. Second, praise can be a part of the reward. Even the second servant, who earned five cities, was not praised like the first, to whom Christ said, “Well done, thou good servant.” I used to love to get praise from my dad. It made me happy to see how pleased he was with what I had done. I would sometimes do an extra-special good job just to impress him. Also, notice the order of these servants is what you would expect. He that did the most was first in line, and he that did nothing was last. Those who are doing their best for our Lord are hoping He comes back today, and those who are not doing what God wants hope His return is far off. Thirdly, rewards are based on faithfulness: “because thou hast been faithful.” Anyone can be a quitter! You want to hurt God’s work? Just quit! Surely you can find a good excuse to quit: Someone was rude to you, your efforts are not appreciated, or others are exalted and received the position you deserved and expected. In this life, I have stood up front and received praise while my wife stayed in the background. But she and God know that I could not have done it without her. One time while Nancy was doing an undesirable job no one else would volunteer for, I asked her what she was thinking about. Her reply, “I was thinking that if Christ came back now, He would find me serving Him.” What will keep you faithful in the hard times (I John 2:28)? Fourthly, we are rewarded even for “very little” things. It seems like ever since I was in the military, it’s been my job to pick up papers and trash off of the ground. My pastor asked me once to come down early and gather up trash at the church, and he wanted me to do it on a regular basis. I asked if there was not something else I could do, and he responded, “Brother, it’s either you or me, and I’d rather it be you.” When I became a pastor, I trained our people to pick up paper. I even showed them how to do it. But on Sunday morning, it was as though I was the only one who could see the paper. You might think that's a little thing, and actually it is, but God rewards for “very little” (see Luke 19:17). Want to try something a little harder? Serve as a nursery worker. Our ladies will come to church, sometimes forgetting it’s their turn in the nursery, receive a tap on the shoulder, and hear a sweet voice saying, “You’ve got the dirty duty.” Off she goes to change smelly diapers with crying babies, and one that will burp on her new dress. After the service, a mom will get upset with the worker because she forgot to change her baby's diaper. Of course, this worker is not receiving any pay for this, and she is beginning to wonder if even our Lord could put up with such. The only time I made the honor roll was in the seventh grade. The reason I never did before or after is because I wasn’t interested in it. If you say I should have been, you're right, but then I didn’t care. All I wanted was just to get through school. My older sister, on the other hand, always made the honor roll, and she loved to show Dad her report card. This usually got me into trouble because my report card came out at the same time as my sister’s, and Dad would say, “Son, where is yours?” Then I had to find my report card and show him, while my sister stood behind and listened as I was rebuked. What motivated me to make the honor roll, that one time in seventh grade, were two girls who had made fun of my grades. They had made the honor roll for the semester and were congratulating each other when I decided I would join the conversation. I said, “I could make the honor roll if I wanted. All you’ve got to do is study.” They stopped and stared at me and then just laughed out loud and walked off! I thought, “They really think I’m stupid.” I decided this once I would do my best and make the honor roll! That next semester, on my first test I got a B, which really bothered me because I thought, with all the effort I put in, I would surely have earned an A+. Then a terrifying thought came over me: “Maybe I really can’t do this!” I’m glad on my second test I merited an A; otherwise, I might have given up. By the way, I had to move away from my friends and sit up front in class because my buddies would cut up, and I could not listen. This brought me a little persecution. “You trying to be teacher’s pet? You think you’re better than we are, don’t you?” Actually, it was “no” to both questions. I just wanted to make the honor roll. The Bible tells us we are deceiving ourselves if we think our wrong friends will not affect our Christian life (I Corinthians 15:33). He put down his lunch pail and began to read my grades and then said, “I’m proud of you son!” And added, “I guess you will be getting grades like this from now on?” I just shrugged my shoulders. What's the point? Our report cards are coming up in Heaven. Some will get “gold, silver, precious stones” and others “wood, hay, stubble” (I Corinthians 3:12). What are you living for?